I was playing in photoshop the other day and wanted to see if I could invert the colors in a photo withot inverting the grayscale values (ie the blacks and whites). After stumbling through a few different ways to achieve my end result, I found what I find to be the simplest way. Step 1: Start with an image that already has a feel that will compliment the end effect. The processing will never "make" the image. So, if you want a good end result, start with a photo that fits the bill. Step 2: If you want to simulate the defocused effect that I did in camera, keep reading, if not, go to the next step. Next, change the layer's blend mode to overlay. Alternately, you can choose luminosity if you want a more subtle effect. Group or merge these two layers and continue on to the next step. 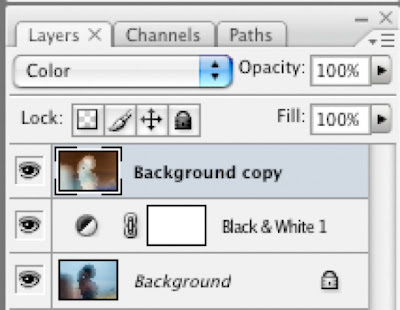 Step 3: Duplicate your layer, and hide it (click on the eye in the layers palette). Go to the background layer and convert it to black and white. For the sake of brevity, and assuming most people reading know how to do this, I'll let you decide how to tone your black and white layer, any method works fine. However, keep in mind that any areas of pure black or white not in the color version will lose color value. Step 4: Make your color layer (which should be on top in the layers palette) visible again. Hit command (or control, PC users) + I to invert it and change the layer blend mode to color. There you go! Make any tweaks you want and save. Below is a screengrab of my layers palette when I am done.